Are MOOCs disruptive innovations to education? This is a controversial question, as author argues that MOOCs are not disruptive innovations to education, but internet is. In this who’s afraid of the big bad mooc? Is MOOC a threat to quality education, especially at public universities? When MOOCs reach a critical mass, where students would accept and prefer to learn through the free open course, rather than going to pay for a course, then it is/could be. How is quality defined? It is defined by users, students, not just by the education providers, MOOCs providers, employers alone. So, if you are to define quality education, we need to consider the different dimensions as “defined” and perceived by the “consumer”. That also makes MOOCs sound like disruptive innovation, as it could “easily” replace any courses by the super-rock-star professors who could afford to spend hundred hours in delivering their videos, and that they have established their reputation in the HE for decades. Would this be a competition between education chains, professors, etc.? It really depends on what each of the stakeholders are looking for. For learners, what are they looking for? Of course, if the elite HE institution is going to recognise their study and learning for free, why not? Each of the professors could be “right” from their perspectives. If a professor is to use another professor’s work, why not? But then, there are implications and perceptions, also from the students’ perspective. If what the students are studying with are some other professors and some other MOOCs, then why should they be learning with the same institution and or professor? And why should they pay whereas somebody study for free? We all look into all these from “ones” perspective. When we could empathise and look deeper into the “issue” relating to these online learning, and internet-based learning, then we would realise that the internet is the main driver in disrupting everything else. These MOOCs are just catalyst as a disrupting agent, platform, where everyone wants to get the best out of it. What does it mean to have more MOOCs? 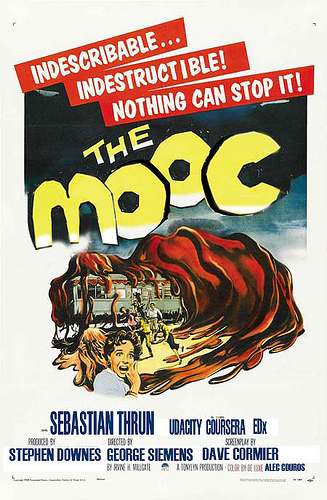 I have been thinking about when MOOC would come to a saturation point. More participants can mean more problems, however. Some academics emphasize that cheating is virtually impossible to measure—posing issues for the courses that are given for-credit. Additionally, though thousands of students often sign up for popular courses, only a select few will go on to complete all tasks necessary for credit. In Noor’s first Coursera course, taught this past Fall, he said that only about 2,000 participants completed the requirements of the course, which initially had about 33,000 enrollees. In the case of formal online courses, would a low graduation rate of 10% be allowed to run? I think the professors would be first to explain why there is such a low pass rate. In a MOOC, that is however, acceptable, and to be congratulated instead. That sounds interesting, not only that MOOCs are unique, but are un-questionable, indestructible. It is a grand experiment after all, always in Beta phase. Justin sees MOOCs in an unique way in this post on Why do professors hate MOOCs let me count whys. “Faculty members must feel this, & thus supporting MOOCs like digging their own graves. More MOOCs would lead to more cost-effectiveness in the delivering of courses for elite institutions, though this could also lead to a decrease in the demand of courses offered by “traditional Higher Education Institutions” as the students flocked to the MOOCs. Would this lead to decrease in the demand of faculty professors? Would this explain why MOOCs are welcome by some (super professors), but not all other professors, especially if their jobs are at risk as a consequence? “Why educators should hate MOOC” as concluded by Justin. Though I could see the disruptive power of this MOOC innovation on Higher Education, I do think there are many opportunities for educators to re-build Higher Education in a constructive and contributing way. Indeed, there are many alternative pathways that would “save” the crisis of Higher Education, which included the shifting of paradigm towards a Constructivist and Connectivist approach in the learning and teaching practices, with the adoption of Creative Classroom and Community and Networks of Practice as Learning Platforms. As I have shared in my past post, MOOC has its own life cycle, and what we need to understand is where it is now and when it would start to change, given that it is hard to sustain just as Freebies. Soon, there would be a business model of MOOCs, and we would be able to see how they could “replace” part of the mainstream online or face-to-face courses. So, the reality is, MOOCs are here to stay, and there would be a significant impact on some of the traditional institutions, and the faculty professors. What would happen next? Just check on the MOOC growth, and pedagogy employed, and you could likely predict its future. I reckon MOOCs would behave similar to the COPs in some ways, though once the novelty is gone, creative learning environment (Creative Classroom – which is coined in the paper) would take its place. History will tell if this happens. There is always a life cycle – and MOOCs have no exception, especially if it is based on a Venture Capitalist model of quick launch, and “fast education” sort of entrepreneurship model of education. It is difficult to predict when this “bubble” would continue to grow, or would join another few bubbles for growth, especially when the government/education authority is going to support or regulate (and in fact this is happening in the USA). This would likely turn education into an arena where the “fittest” survive and thrive. Monetization and privatization of MOOCs must happen before another model could come in. Photo source: Tony Bates’ post. How important is emotional intelligence (EI) in teaching and learning? Emotional Intelligence will be introduced into trainee teacher education, and that teachers would be tested on their EI in their course of study. Do we need emotional intelligence tests for teachers? I think emotional intelligence is important to our daily life. Not only educators would require certain forms of “training” and development in EI, it seems that learners would need them too. How and what sort of “training” and development programs on Emotional Intelligence would be helpful and supportive for educators and professors? Our society seems to focus a lot on the training and education of new teachers. How would teachers learn best in Emotional Intelligence. Here are my posts: (1), (2), (3) on emotional intelligence. Emotional intelligence should be valued in CCR as it is a key factor for creative learning. It can be fostered through a variety of activities that aim to help learners recognise and manage emotions, form positive relationships, and successfully handle the demands of growing up in a complex and constantly changing world. There are now courses offered on Emotional Intelligence including this one on Coursera. I think the best way to learn about Emotional Intelligence would be action learning, where EI is used for personal reflection, together with research and practice at work (in creative classroom), where educators (professors, leaders etc.) and learners could learn from each others. Have we forgotten that every one of us is a learner, including the directors, CEO, managers, professors, teachers and learners within institutions, and in social and learning networks? Training the new teachers on EI alone would not improve the overall “QUALITY” of education and learning, just like quality cannot be designed by the Quality Manager only. I think EI needs to be more thoroughly researched, theorized, practiced, and reflected, before it is “forced” through human’s minds. EI itself is not a panacea to all problems of education. Educators and learners should realize that EI could help them in overcoming obstacles and building resilience in their learning journey. However, we shouldn’t be “testing” EI in order to ensure compliance with regulations, in order to screen the “good” teacher from “unsuitable” teacher. Rather, we should think of encouraging teachers to develop their creative thinking and learning capacity, critical thinking capability, and problem solving ability, with their EI so as to support and improve the education system – by leading, coaching and mentoring their leaders, supporters, peers and learners. In summary, we could develop EI in our course of learning. EI should be viewed as a strategic affordance that would help leaders, educators and learners in recognising and managing emotions, forming positive relationships, overcoming obstacles and building resilience in their learning journey, resulting in their abilities in solving problems and making decisions. We should be encouraging all educators (professors, teachers, administrators) and learners to co-develop and co-learn with their colleagues and learners, in order to improve overall QUALITY of education and learning. The tectonic shift due to MOOCs has disrupted Higher Education and Universities. How would new models of higher education (HE) be based on? Ever thought about fantasy in education, where higher education is offered free to anyone around the world? 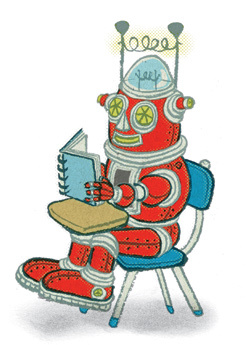 MOOC: how-coursera-free-online-education-service-will-school-us-all tells the story. Coursera’s mission is simple and yet absurdly grand: to teach millions of people around the world for free, while also transforming how top universities teach. And their business model? Well, they haven’t quite figured that part out yet. If MOOCs are run and managed under social entrepreneurship, then I wonder what MOOC would look like? Radical social entrepreneurship sounds innovative and disruptive, when applied to education. Such MOOCs have now developed into an opportunistic venture, where social, entrepreneurship and online learning are all blended under an elitist education brand icon. After all, the literature of entrepreneurship has long established the notion of “co-creation.” Social entrepreneurship has taken this idea to new lengths as can been seen here and here. Can we call MOOC the fantasy and education of the time? Format: Pre-recorded video lectures and live video chat with classmates and discussion leaders. Cost: Up to $20,000 a year for tuition. Sample course: As an undergraduate at Wharton, Nelson designed an interdisciplinary class that had undergraduates work in groups to review the scientific literature on obesity. Cost: Free for now. Eventually, perhaps $100 in tuition for a master’s degree. Is a bad idea a good idea? This article about BadIdeas provides some interesting insights. This paper describes BadIdeas, a collection of techniques that uses ‘bad’ or ‘silly’ ideas to inspire creativity, explore design domains and teach critical thinking in interaction design. 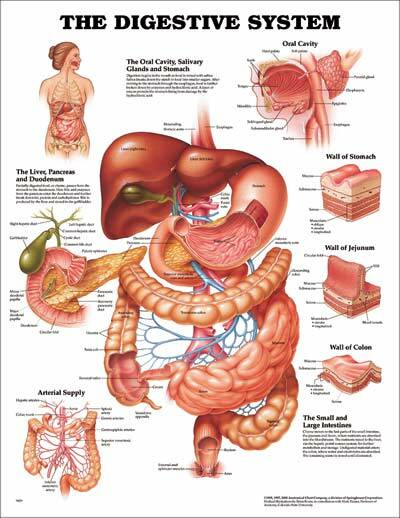 We describe the approach, some evidence, how it is performed in practice and experience in its use. Is social creativity more productive than individual creativity? Hence, in treating design as a creative process, we must understand it as a social creative process. We argue that theoretically social creativity should be more productive than individual creativity, and so design teams should be more creative than individual designers working alone. However, there is a considerable body of experimental evidence that suggests that real groups are less creative than nominal groups. This dampening effect on social creativity is primarily the result of three interacting social influences: production blocking, evaluation apprehension and free riding. Based on such findings, Can we treat the design of Open Course as a social creative process? How would open courses allow for social creativity? What are the creative design considerations in Open Courses or Networks? 1. What effect does the number and type of available communication channels have on social creativity? 2. What are the effects of public, social and private interaction on creativity? 3. What are the optimal means to increase individual performance by reducing the effects of free riding while not inhibiting creativity by increasing evaluation apprehension? We have been thinking about collective wisdom, wisdom of the crowds and social creativity in different social or online spaces/media – Facebook, Twitter, Blog Community or Wikispaces/educators, Youtubes, MySpace etc. Could we apply the concept of social creativity in learning and social networks? How could we foster cooperation and collaboration amongst networkers in the generation of more creative ideas, processes and products, and so creating more creative networks? What are your experiences and views on social creativity? Postscript: I would like to refer to George’s post on Reflection on Open Courses here. How would social creativity be emerged from Open Courses such as MOOC (CCK08 Solution)? In this Management Innovation and Online Higher Education Part 2: Management Innovation “New services are emerging that allow prospective students and their parents to hear from existing and former university students. As more information becomes available, online programs will need to be ready to demonstrate superiority. Those that produce content according to the ‘cottage model’ (described above) will appear amateurish.” Well said. Will “superior content” and/or content based online programs be good enough to demonstrate superiority? Would a learner-centred approach towards learning be an alternative way of satisfying the students (and the stakeholders too) needs? What is expected from our learners and society? Would the emphasis be based on the education and learning process? The current Web 2.0 is still not yet integrated into the LMS, and so it becomes a struggle between professors and lecturers in the classroom trying to capture the attention and interests of students, versus students going everywhere like MIT open course ware, Standford University and various university sites and resources, wikis, blogs, Delicious, social networking sites – Youtubes education, etc for the most up-to-date knowledge and information. 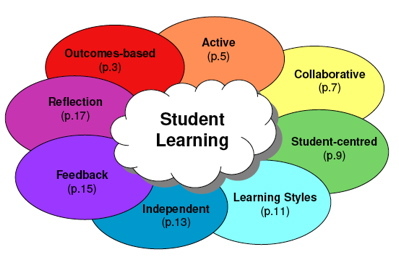 So, how about the integration of PLN/E with LMS based on learners’ needs and expectations? Would this be the fundamental strategic move that educational institutions could consider? Would this allow for a big leap in both teaching, learning and research that would benefit both educators and learners, and the institutions? Replacing the old wine skin with a new wine bottle would help in solving the problem, rather than pouring the new wine into the old wine skin, where the new wine would soon leak out. Here the old wine skin and the old wine is the traditional classroom approach to education and learning and the rigid and static course content, the new wine bottle and the new wine is the heutagogy, social media learning and LMS/Web2.0 with educators, experts and c0-learners as resources and support. Disruptive innovation has significantly changed the way we perceive success in the commercial world. Many corporate leaders were superceded by the niche markets innovators during the last few decades. Was it a result of the disruptive innovation? Isn’t there a similar phenomenon observed in the digital world of networking? Within the last few years, there were great changes in the use of technology. See how the Web 2.0 technology has taken roots and being adopted by hundreds of millions of people. Simple, fast, and easy to use tools taking over the complicated, hard to install tools and technology. Mobile, iphones and ipods are pervasive. Lap top computers taking over the desk top computers. Personal blogs taking over the formal web pages. This is followed by microblogging on Facebook and Twitters taking over some of the personal blogs. Digital social networking taking over some of the formal social communities. How about the impact of all these “disruptive innovation” on news media, formal education, learning, our formal careers, and our daily habits?